Perhaps a better title for this installment is “measure twice, cut once” because as it turns out two trips to the Club were necessary to get the building placement correct. But I’m getting ahead of myself. 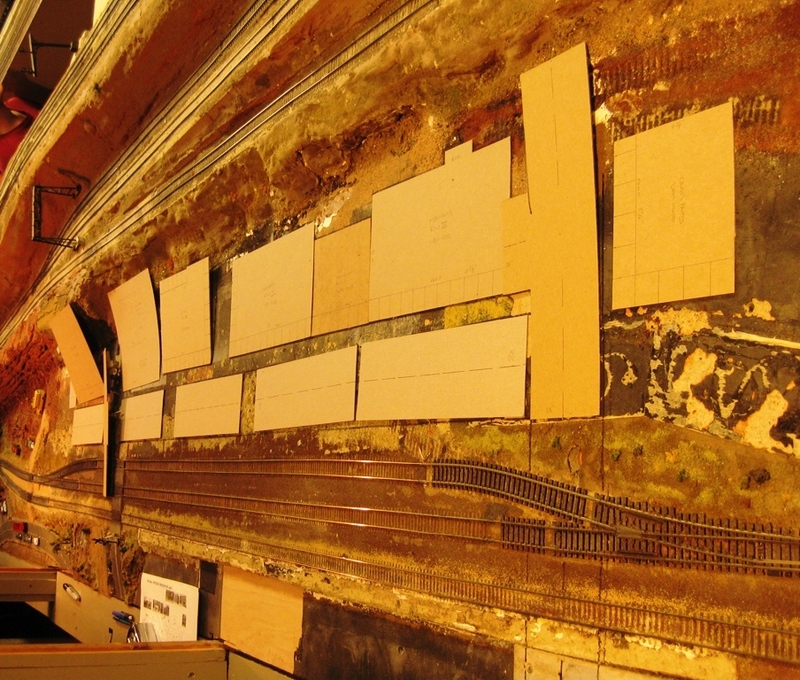 Many years ago I learned the best way to approach a project was to start with cardboard mockups. Whether they were 3-D or simple footprints didn’t really matter, so long as the mockup reflected the final desired measurements of the structure. Moving drawings around on a Visio plan is pretty simple, but moving cardboard mockups around on the actual layout tell the real story. 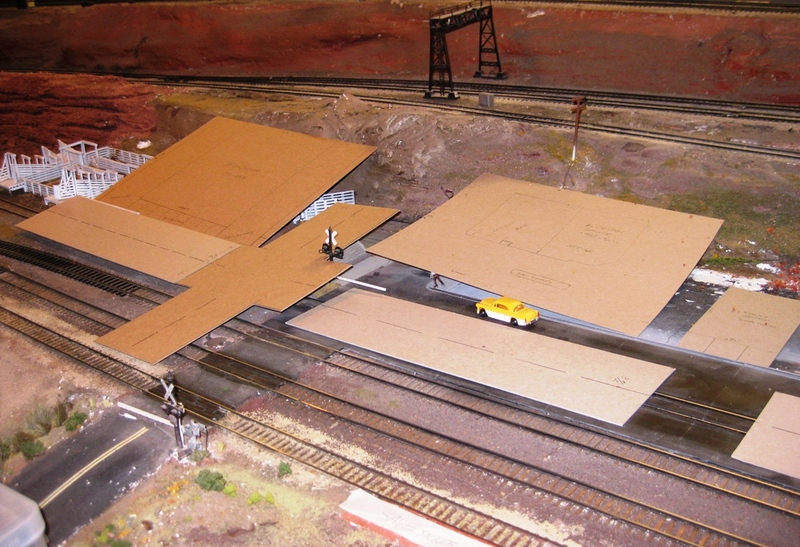 It answers the key question, “Will it fit?” and when it doesn’t, “What do I need to remove?” So with this lesson in mind I used sheet cardboard (collected over the years) to create footprints for each of the buildings, as well as sections of roadway and intersections at the desired 3.5” width (or approximately 25’ in HO). I made my first trip out to the Club in late January. 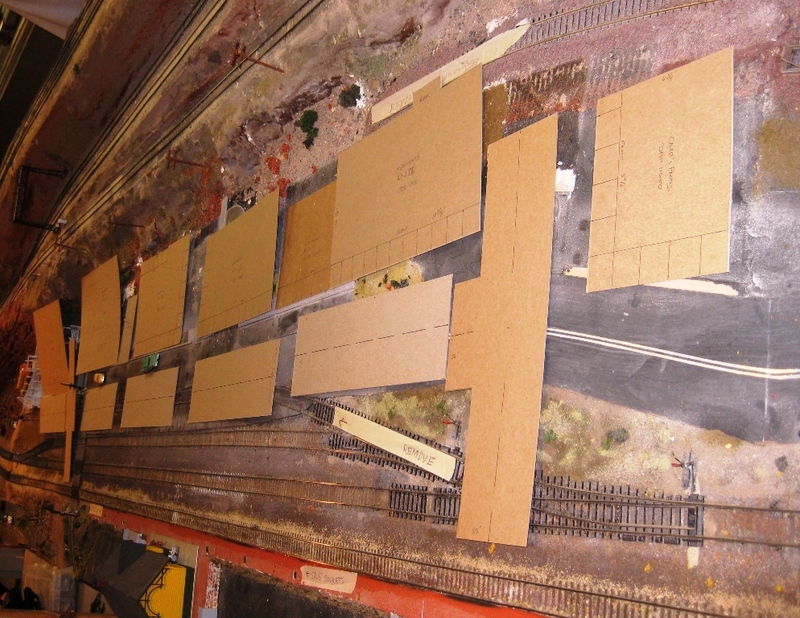 My intent was to move the existing buildings, vehicles, and figures out of the way to lay out the cardboard footprints. After doing so I made a few minor measurement and placement changes my plan diagrams. In general, I confirmed that the approach was feasible. At that point I was ready to put everything back until a future visit when I would tear out the existing town, but the guys convinced me to commit to the project and about an hour later Hill Valley was gone. We packed up all the old structures, returned the people, vehicles, and trees to bulk storage, the excess track was removed and re-laid, the ground cover scraped up, and the mess vacuumed up. One discovery during this exercise was that my current plan did not allow for any on-street parking. Instead the sidewalks were aligned right up against the roadway. As anyone who shops in old downtown areas knows, finding a parking space is challenging. So it was decided to move all the buildings back off the street about 1.25” to allow for parking. Here was the first major plan adjustment that resulted from the test fit. I was pleased. In early February I decided it would be a good idea to make second test fit trip to the Club. My intent was to lay out the footprints again, confirm their placement, trace around them with black marker, remove a bit more scenery, and get the area ready for my scenery folks to prepare the space. As it turned out the second trip was well worth it, because I discovered issues with the placement of San Francisco Street. Instead of falling “just to the left” of the turnout off the main creating the passing track, in fact it was falling right “on top” of the turnout — not a good thing. This meant I needed to rearrange the buildings to compress about 5” to allow the road to be moved to the left. It took some experimenting, but in the end I managed to do this by moving the Bar out of the main downtown scene and placing it to the left of the Bus Terminal on the edge of downtown. With new placement confirmed, I used black marker to trace the outlines of roads and buildings. 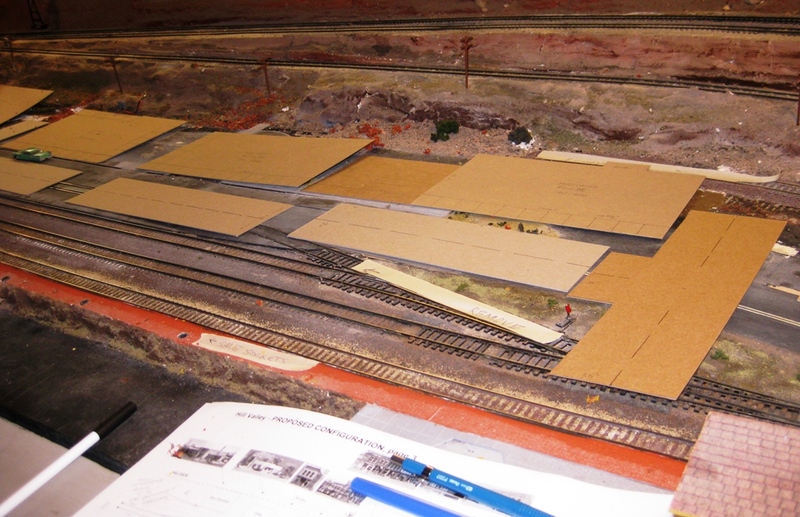 I also used masking tape to leave notes for the scenery folks to cut back the hills behind Hill Valley, to build up the base in front to bring the new depots up to track level all the way across, to remove the existing roads and crossing equipment, and a few other tasks. Now with the updated placement well understood, I updated the plans to reflect the new on-street parking, the adjusted building placement and measurements. 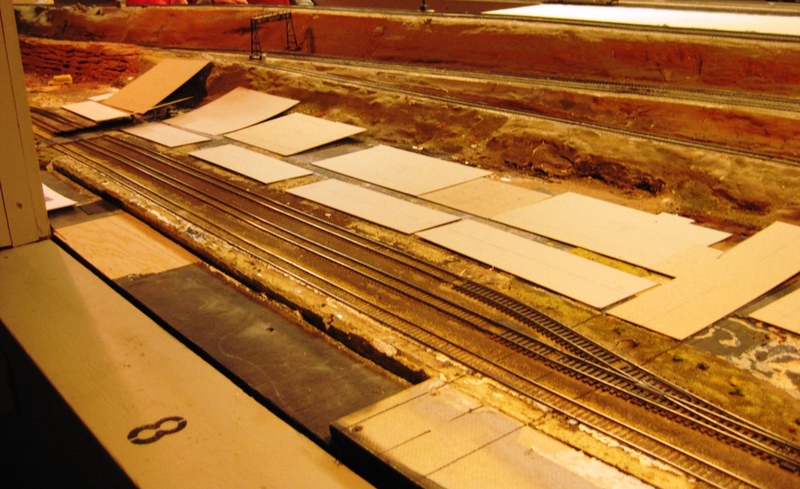 As I mentioned at the beginning of this post, “measure twice, cut once” – now I’m confident everything will fit and can proceed with building construction while my scenery folks finish prepping the area. Well I’ve got painting and gluing to do. Check back again soon! – Phil S.
This entry was posted in Project “Hill Valley”. Bookmark the permalink.